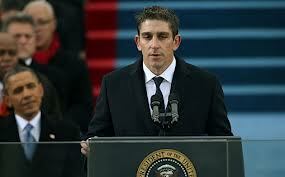 This beautiful man, who also happens to be Cuban and gay, made one of the most beautiful presentations of his poem, in my experience, in my lifetime (except for perhaps Maya Angelou, who presented I Know Why the Caged Bird Sings at President Obama's first inauguration ceremony in 2009). Watch a recording of Mr. Blanco's speech at ABC's website at the link below this paragraph (And study his beautiful poem). He delivered a remarkable performance, equal only to the amazing singers that also performed today. The poem that Mr. Blanco delivered was so utterly perfect. It was like listening to a symphony...or a beautiful performance of a choir. It was so simple. It was so accessible. It was so of "our time" and it was utterly miraculous that this beautiful human, Mr. Blanco, was chosen for this privilege and at the same time our 44th President addressed in his second inauguration speech his support for gay rights. None of this happened by accident. But thank God it finally happened...even the President's reference in his speech to "Stonewall" in the same category as "Selma" and other milestones in civil rights in this country. Today was remarkable in so very many ways for me. First, the only black US president took an oath of office for a second term, and despite the most uncivil, barbaric and openly racist attacks. But he also addressed, in this second inauguration speech, gay and lesbian rights. His predecessor, "Shrub" and his party, have for decades shown their hatred for gays. But not only did Obama address this in his speech but he chose a remarkable person to deliver a poem for this ceremony, that was utterly for it's time. My goal with this blog is to talk about things of beauty. Today was a day of beauty. 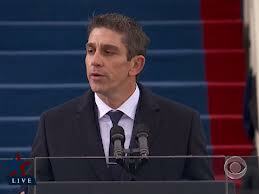 I salute President Obama and I salute Mr. Blanco for his beautiful poem. Kelly Clarkson blew everyone away with her soulful 'My Country Tis of Thee' and then Beyonce knocked it out of the ball park with the National Anthem. I've tried to embed videos of these performances. They aren't available at this point, except to share on facebook or twitter, two forums that I detest. Will try to update this when I have videos to share. Meanwhile, don't miss these performances.